Lenders appear to be easing the way for lending in areas crucial to the home construction industry. The National Association of Homebuilders said its fourth quarter 2017 survey of builders and developers showed a net easing in conditions for funding acquisition and development of construction sites and for construction of single family homes. 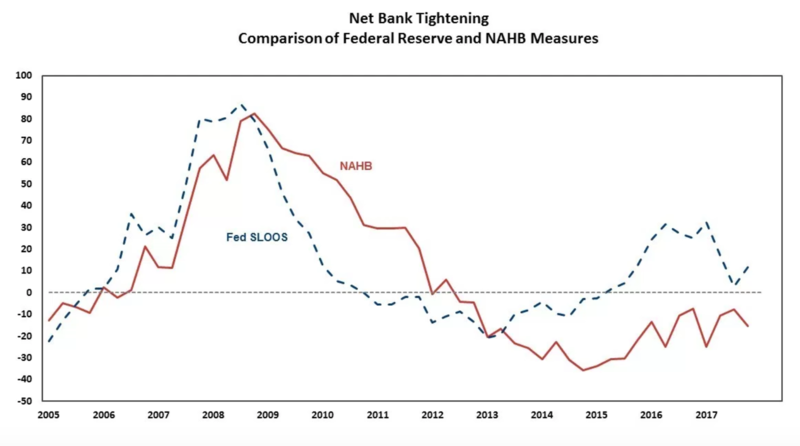 The measure of overall AD&C funding on NAHB's tightening index was -15.7, compared to -7.3 in the fourth quarter of 2016 and -7.6 in the third quarter of 2017, indicating that the easing was accelerating rapidly. 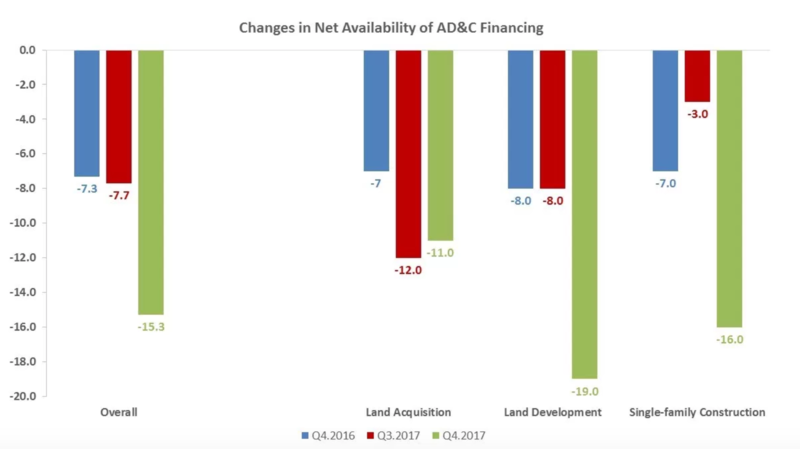 Individual readings also indicated that an acceleration of easing for both development and construction funding, there was a quarter-over-quarter change of 11 points toward the favorable in development conditions, while conditions for land acquisition tightened slightly. The reason for the relatively large decrease in net tightening over the quarter across land development and single-family construction loans is because a larger proportion of respondents indicated that standards had gotten "better". While there was a large percentage increase in the share of respondents indicating that land acquisition loan standards had gotten better over the quarter as well, it was offset by a large increase in the portion of respondents saying that standards had gotten worse. The net tightening across all three subcategories represents the difference between the proportion of respondents saying that conditions got "worse" and the share answering that conditions were "better". The Overall Index reading is the arithmetic mean across the three sub categories. NAHB's financing survey had converged with the results of the Federal Reserve Board's Senior Loan Officer Opinion Survey (SLOOS) for the two previous quarters. The most recent SLOOS however indicated lending conditions were tightening. The pace of easing and tightening recorded by each survey also accelerated so the two diverged. The two surveys have different universes of respondents; NAHB queries consumers while SLOOS is a survey of lenders. Further, the Fed vehicle includes commercial real estate and other non-residential lending.